You know summer has reached the Adirondacks when the leaves are out, the grass is growing, and bees and butterflies are hastily collecting nectar and pollen from our garden flowers. In recent years, however, researchers have noticed declines in bee, butterfly and other pollinator populations, creating a phenomenon known as the global pollinator crisis. To help raise awareness for the important role pollinators play in our landscape and to increase the amount of pollinator habitat in the Adirondacks, the Lake Placid Land Conservancy joined a new initiative called the Adirondack Pollinator Project (APP). The effort is led by AdkAction.org and joins the Lake Placid Land Conservancy, The Wild Center, and Common Ground Gardens as partners. Our project formed in the fall of 2016 with the mission of promoting the health of pollinators, critical to food and ecosystems, through conservation, education, and research. The purpose of the project is to build awareness, knowledge, and understanding about the global and local importance of pollinators across the Adirondack region and to empower people to take individual and collective action to help pollinators thrive. The Adirondack Pollinator Project is hosting a number of events and workshops throughout the spring and summer of 2018 to support pollinator-friendly efforts. Programming launches National Pollinator Week, June 18 – June 24, where APP partners will be distributing Adirondack-specific seed packets, discussing the benefits of planting native, and sharing other pollinator information at area Farmers’ Markets. This is followed by a number of other events throughout the summer, including an invasive species training workshop, free film screenings on the Rusty-patch bumble bee, citizen science opportunities, DIY pollinator garden workshops, farmers markets, and a free lecture by by Kim Eierman, an Environmental Horticulturist specializing in ecological landscapes and native plants. LPLC will be offering pollinator monitoring demonstrations throughout the summer (dates to be announced). If you have a pollinator-friendly space and are interested in hosting a monitoring demonstration at your home, please contact Kerry. We also welcome others to join us by becoming a citizen science monitor. For more information or to view a full schedule of events, please visit our Events page. The good news is that there is a lot you can do to help protect and restore pollinators. Plant a Pollinator Garden. A wonderful way to help pollinators is to create a pollinator garden at your home. 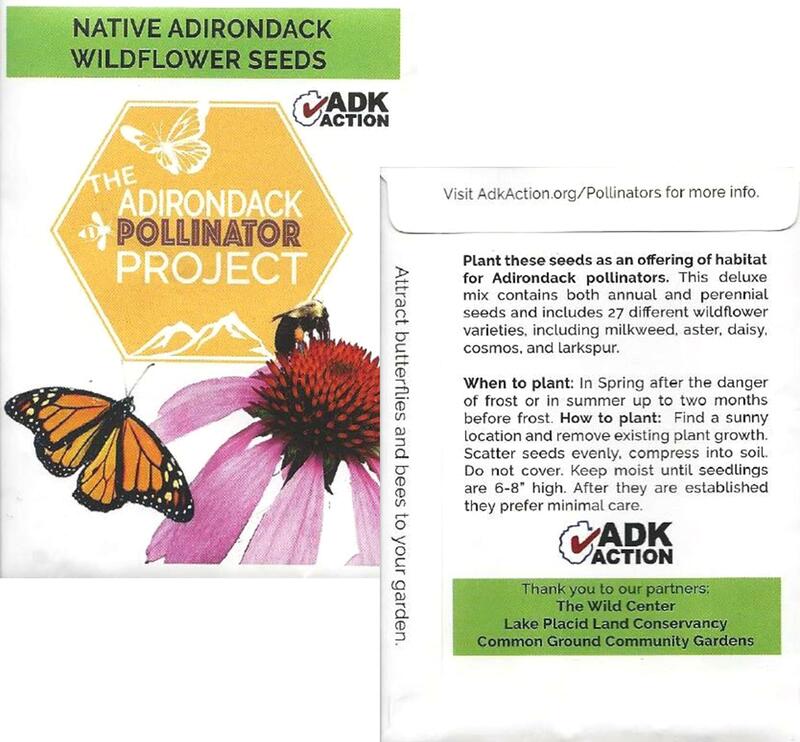 If you live in the Adirondack region, pick up one of our seed packets at LPLC’s office in Lake Placid, local farmers’ markets, The Wild Center and many participating businesses and start planting! A good rule of thumb is to think about transforming ⅓ of your lawn to a pollinator garden or no mow zone. To avoid contamination from invasive plants, it is very important to find a good, local source for native seeds and plants. Local plant nurseries, garden clubs, cooperative extensions, and farmers’ markets are all great places to learn what grows best in your area. Alternatively, if you are not able to plant at home, encourage your workplace, school, parks, community or even roadsides to create a space for pollinators. 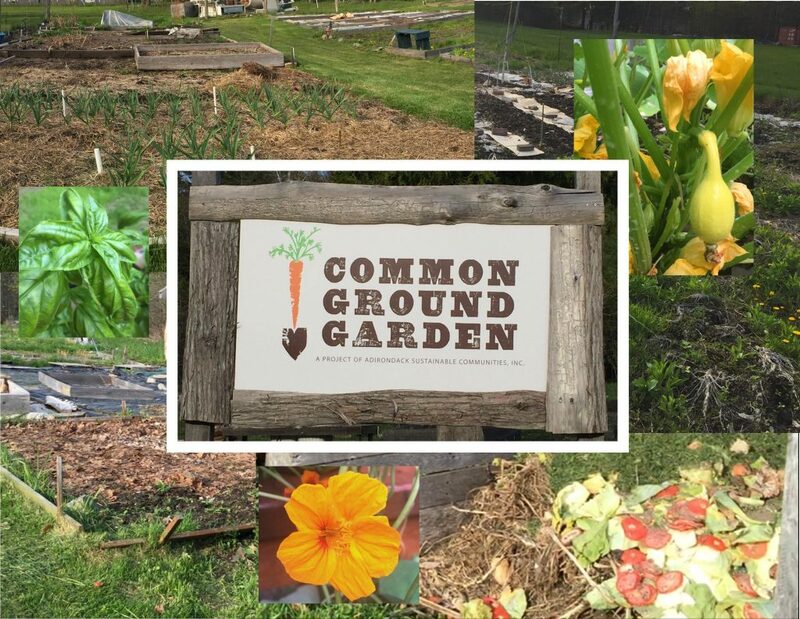 You can also look to local garden clubs like Common Ground Gardens and start your own garden plot. Become a Citizen Scientist. Citizen science is when the volunteers from the public work with scientists to solve real-world problems. The growing field of public participation in scientific research (PPSR) includes citizen science, volunteer monitoring, and other forms of organized research in which members of the public engage in the process of scientific investigations, including asking questions, collecting data, and/or interpreting results.To help interested landowners better understand pollinator activities on their property, LPLC developed a Conservation Monitoring Program that invites citizen scientists to monitor their property for wildlife, invasive species, birds, and pollinators. We will assess whether a property is suitable for pollinators, for instance, by looking at specific habitat requirements, such as open space and a diversity of flowering plants. We will then enroll eligible landowners who will observe for the presence of bees, butterflies, and other pollinators. Landowners will record their observations which will be entered into a public database where the data can then be easily reviewed and organized. If the property supports a more intensive project and the landowner is willing, LPLC will then reach out to expert scientists to implement more thorough protocols for monitoring. Buy local – farmers markets, organic food. Buy local and organic produce whenever possible. Conventionally-grown crops often rely on monocropping, which is highly destructive to pollinator habitat. Become a patron of your local farmers’ market and natural food stores, and look for the USDA organic label when shopping. Say no to harmful pesticides and herbicides. Pick weeds by hand instead of spraying chemicals that are toxic to pollinators. Practice sustainable agriculture. Choose crops that are labeled non-GMO and plant a diverse group of species throughout the property. Choose natural pest management over the use of pesticides and insecticides. Encourage the development of healthy soils and a wider variety of crops by planting cover crops, addressing erosion issues, and limiting tillage. Research beekeeping. Reach out to local beekeepers and associations to find out if keeping bees is right for you and your property. Regionally – Local Living Ventures in Canton has a monthly bee group and the Southern Adirondack Beekeepers Association has activities in the Albany-Saratoga region.